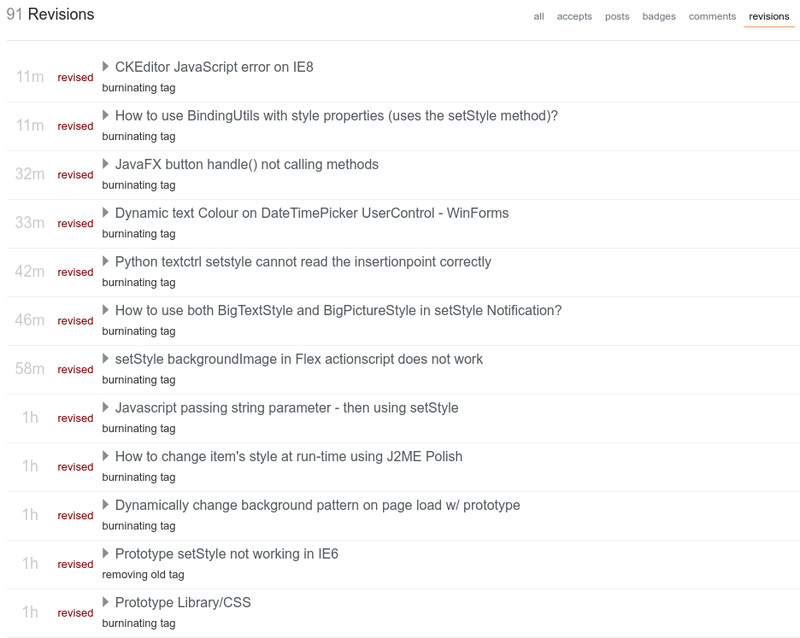 A user is currently suggesting edits to remove the setstyle tag from different questions. How should I handle this? I thought that burnination should always be performed after discussing it on meta and then users with 2k+ reputation editing the questions (and not by somebody under 2k). And here is a review I did of this user. Burnination is not just about removing a tag, otherwise we would have made a bot to do it. Most of the time, the post has other problems. The fire of burnination is not always destructive; it consumes posts that are not worthy, but otherwise it serves as a beacon to guide us to posts that really need to be improved. each row contains three cell's with RGB values. I use these RGB values to set the background of another cell in the same row. On the cell that need to have the background colored* I have a callback which picks up the RGB values and sets the background perfectly. So the whole TableView look exactly as needed. I have a color picker and this picker needs to update the selected row containing the three RGB values. I'm able to set the new three RGB values nut I also need the cell with the colored background to updated itself to the new RGB values. In the code below I have fount a way to do this but I believe this is ugly. I'm wandering if there is a better way. The solution is to @ping the author and to tell them that they are doing this ugly not fixing the rest of the post and that they need to do so. That way, they have an opportunity to change their behavior before they waste the time of more reviewers, and the ban that might result from it. You might think that I am overly forgiving, but I think that there's a possibility that this user may just want to help, but doesn't know the rules. I think that they could become a valued editor if they are given direction. If they take their time and fix the rest of the post, then they will not be flooding the queue to the extent that they are now. Flooding the queue is only a problem when reviewers would need to put more work into fixing the post than the original suggestion did. Sorry, I didn't realize that was wrong to do. I just thought to do it since there were only ~20 questions tagged. Guess I should've looked for rules before doing it. I won't do it again. Re-edited the question properly this time. I will keep in mind the guidelines for the next time. I don't think we need to worry about their edits any more. Of course, I think that we still need to improve the system. It would be really nice if "reject and edit" could be used to teach new editors about editing (with a checkbox or something). A banner could be shown to the user the next time that they went to edit, so it wouldn't be hidden away deep within their profile. Not the answer you're looking for? Browse other questions tagged discussion suggested-edits burninate-system . How to deal with serial tag-only edits from Sub 2k users? What is the correct procedure for a user who edits only the tag? How to handle edits that are too minor, changing title from uppercase to lowercase? What rate of suggested edits is considered flooding the queue? Should not we increase the minimum reputation requirement to review suggested edit? Why can someone “Reject and Edit”, then make an identical edit?